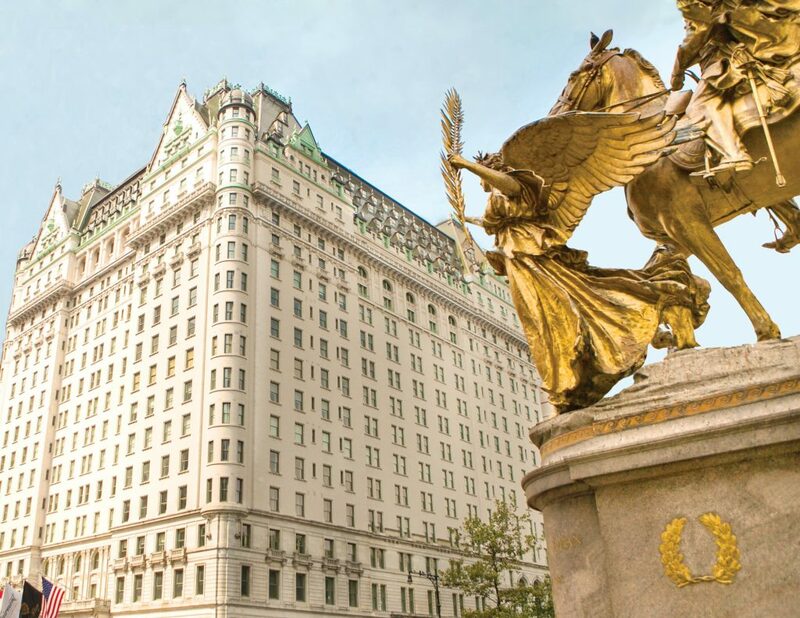 Is there a more iconic hotel in this world than The Plaza NYC? A staple sight on the southern edge of Central Park since 1907, skirting the Upper East Side on one corner and Fifth Avenue on the other, The Plaza is world-renowned as the most luxurious hotel in New York City. Much like Manhattan, The Plaza needs no introduction, really. It’s instantly recognisable, standing tall and grand in front of the Pulitzer Fountain, across from Bergdorf Goodman department store, keeping a watchful eye over the horse drawn carriages that queue along the south end of Central Park. Exuding confidence, elegance and heritage, this eternal classic brings a splash of historic Beaux-Arts architecture to a sky-rising, metallic Manhattan. 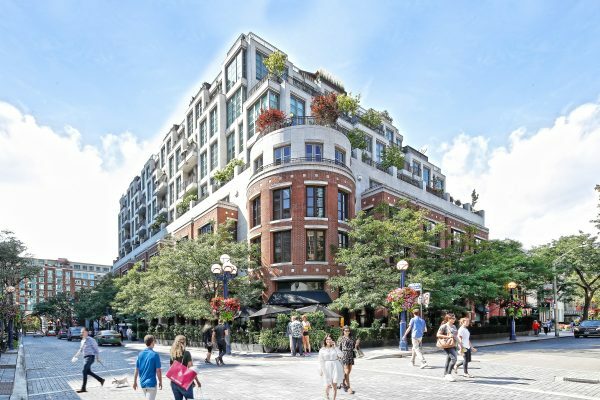 Walk onto the red carpet covered stairs, through the gilded revolving doors, following a welcome from a very polite doorman in a tux, and into the lavish, marble-floored lobby where you’ll immediately feel as if you’re on a movie set. While The Plaza bleeds grandeur, it is not at all haughty. Each reception room offers a different interior character to the next, and while the spaces are quite open plan there remains a sense of privacy for guests and customers alike. 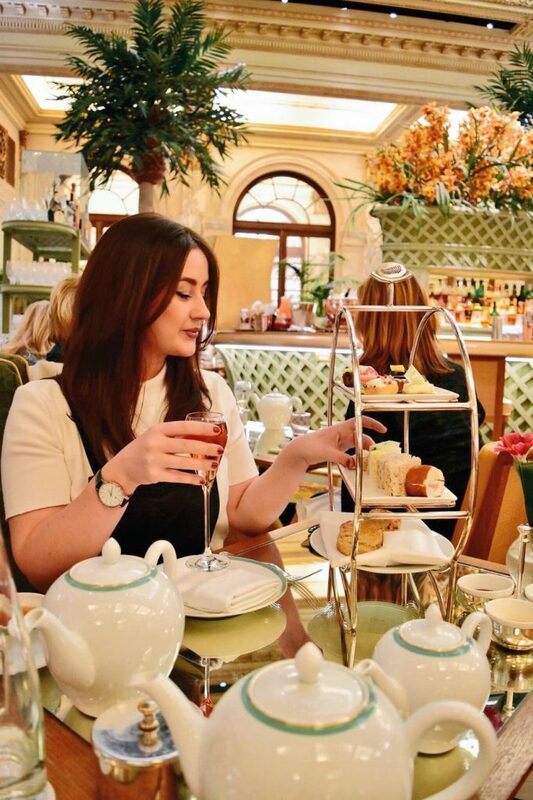 We visited The Plaza for Afternoon Tea; a quintessentially British tradition in the heart of New York City may sound strange, but it was something we absolutely had to try. 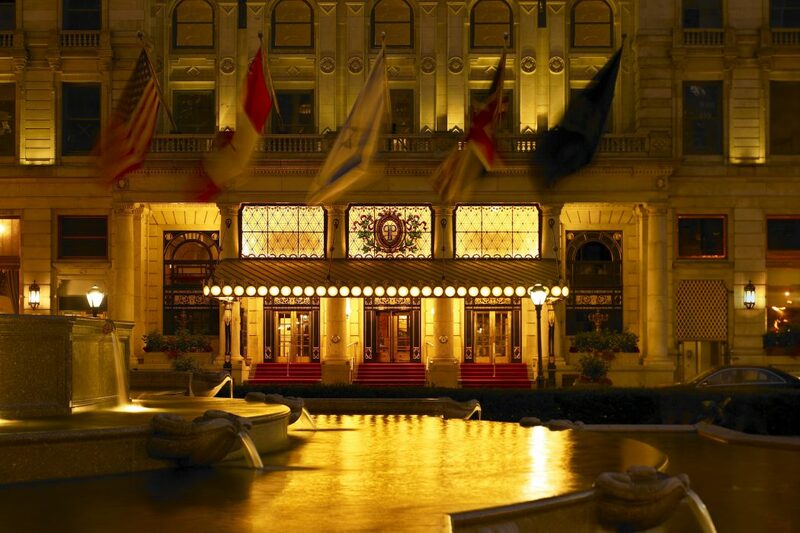 For decades the high-society of Manhattan would flock to The Plaza to while away the afternoons in the Palm Court, the first reception room you’ll come upon when entering the hotel. Akin to a scene in The Great Gatsby, the Palm Court is beautifully colonnaded, encircling a small bar that takes centre stage of the room beneath a stained-glass ceiling and surrounded by a tropical leafy setting. The formal service of the afternoon tea begins at the host’s desk, where you’re walked to your table and introduced to your personal waiter, who within minutes has a welcome Palm Court Tea Time Cocktail in your hand. The afternoon tea menu is vast, and to be honest, can be quite confusing to order from. 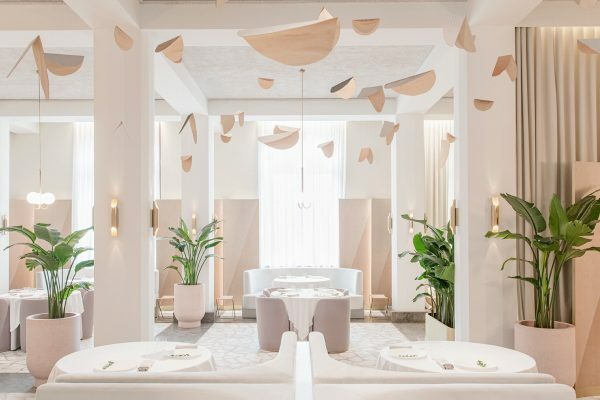 However, the waiting staff are more than happy to talk you through the menu, explaining what each person dining will receive within the set price ranges; $75, $90, $105 or $135. Choose from The New Yorker Tea or The Royal Tea. Our fabulous waiter, Sayeed talked us in to trying both, so that we didn’t miss out on what’s been drawing people to NYC’s most iconic Afternoon Tea for over 100 years. Such is the beauty of not dining solo! Both teas arrive on china plates on three-tiered, circular brackets, leaving plenty of reach room for your favourite morsel. 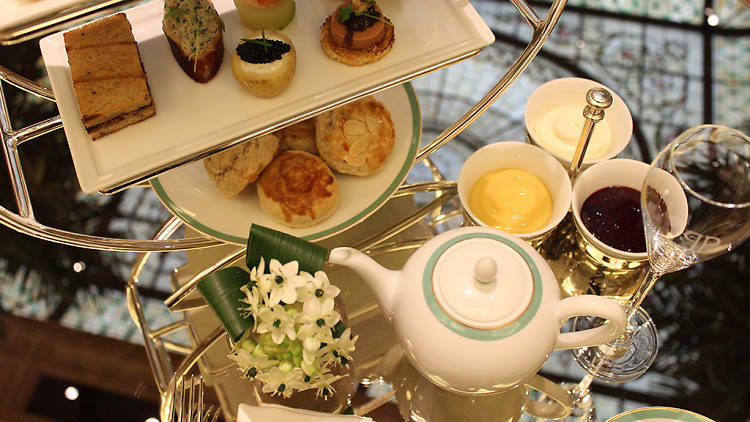 The New Yorker Tea is The Plaza’s classic offering. From the sandwiches and savouries plate, bite into thyme roasted prime rib, balsamic caramelised onions and horseradish aioli on onion brioche, truffled chicken salad with black truffle aioli on whole wheat bread, and many other pastries, tarts and sandwiches to devour before moving onto the sweeter side of the affair. Freshly baked scones with Devonshire Cream, raspberry milk chocolate Eclairs, passion and banana Daiquiri Baba with strawberry compote and Meyer’s Rum, and other delights will tantalise your sweet tooth. Choose from NV, Veuve Clicquot Brut, Reims or NV, Moët & Chandon Brut Rosé Impérial, Épernay to make things a little extra bubbly. The Royal Tea is that little bit more regal, as the name would suggest and is permeated with some recognisable British traditions. The tea is pretty much dedicated to the Royal Family and features Banana Cotton Candy on a toffee pretzel stick, because banana is Prince Harry’s favourite dessert flavour, and a Cornish Crab Salad in honour of Prince Charles, the Duke of Cornwall. This menu is particularly well-researched and well-designed; even if you’re not a fan of the Royals, it’s definitely one to try. It’s also possible to add a glass of bubbles to this Royal proceeding, but if you fancy drinking like a King or Queen, adding a glass of Krug is also an option (disclaimer: one must put one’s pinkie in the air if choosing the latter). Each individual offering, whether from The New Yorker or The Royal Tea was so evidently handcrafted with skill, patience and pride. 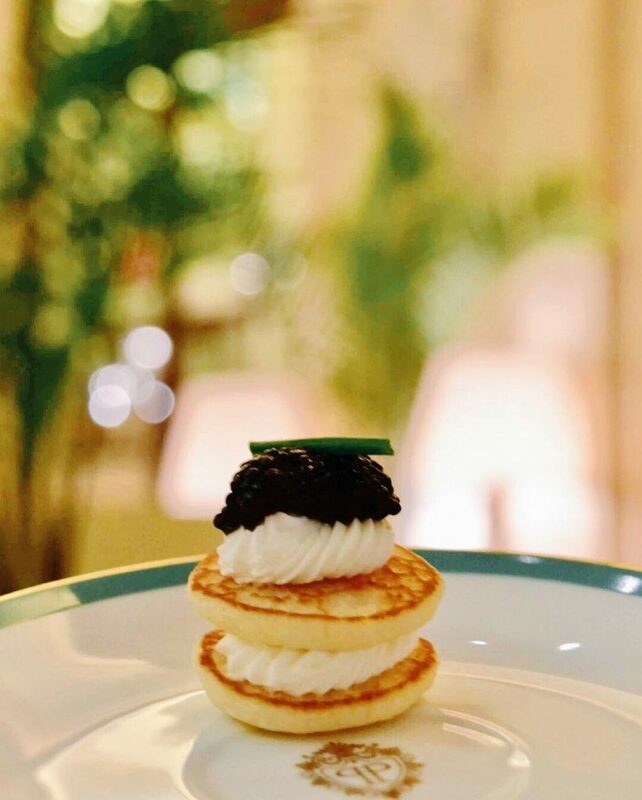 Each sumptuous bite left us salivating for more, and while the tiered plates of delicate treats seem like a mammoth task when they first arrive on your table, it won’t take long for you to conquer them. Now, we mustn’t forget why we all came here – the tea. There are over 25 loose leaf teas to choose from at The Plaza, many of which can be packaged in takeaway tins for customers too. If you’re not a loose leaf connoisseur, fear not, as the expert staff are there to talk you through which might best suit your palette. We tried the Jukro, a Chinese tea with a bouquet of cocoa and vanilla, but with undertones similar to a dark oolong Taiwanese tea, and the Margaret’s Hope Darjeeling Second Flush, because who doesn’t love a Darjeeling tea? We grazed for hours, drinking bubbles and soaking up all of Sayeed’s New York City knowledge. I’d read that the service at The Plaza wasn’t personal due to the number of guests coming and going every minute of every day, but I can say for certain that this isn’t the case. Sayeed and his team offered us impeccable service – it wasn’t snooty, but instead relaxed, familiar and polite. We had a laugh with him about how British people always choose English Breakfast Tea, and he walked us through his favourite parts of the entire menu. 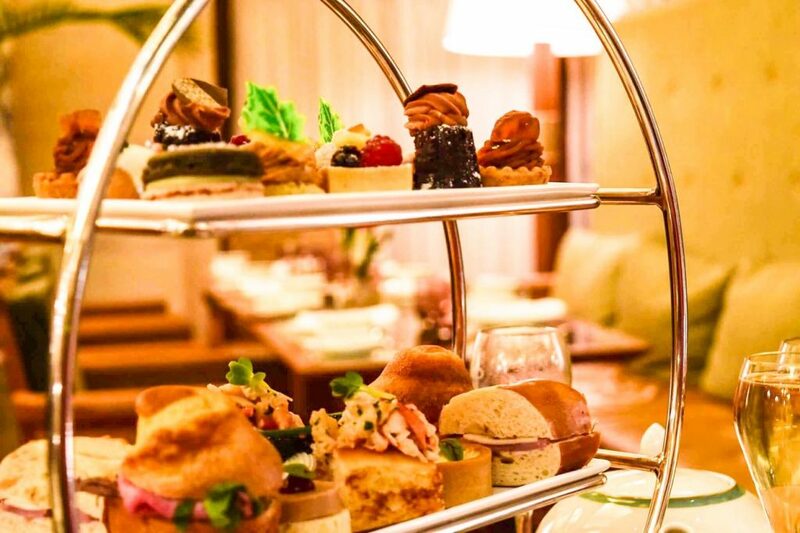 Going for Afternoon Tea in New York is not something usually associated with a visit to the world’s most cosmopolitan city, it’s an experience commonly kept for a rainy London afternoon. However, The Plaza break all the stereotypes of New York grub and tourism with their truly unique Afternoon Tea. 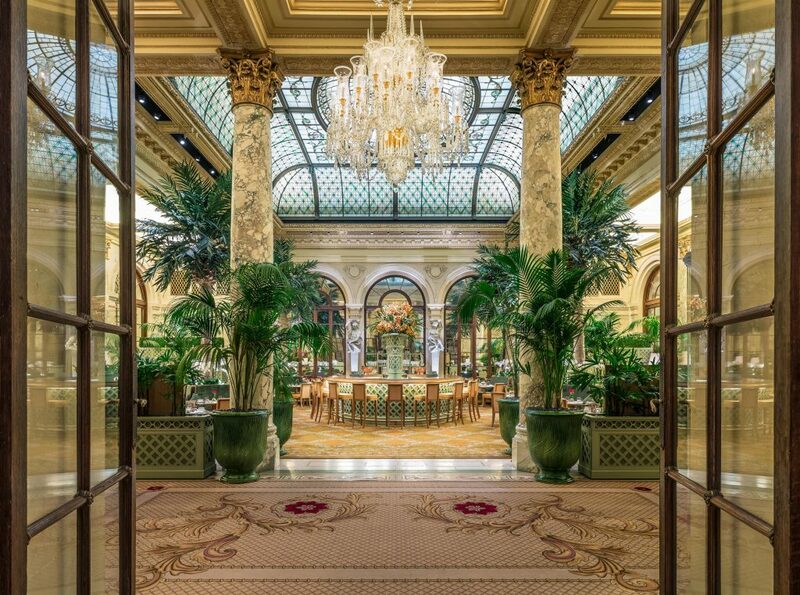 If you’re planning a visit to the Big Apple, go against the grain a little and pay a visit to Sayeed and the staff at the Palm Court for an afternoon of luxury in what is arguably Manhattan’s most illustrious hotel. If you go during the Festive period like we did, you’ll even get a wrapped chocolate statue of The Plaza as a gift! Prices start at $75.00 and a children’s Afternoon Tea offering, The Eloise Tea is also available for $60.00 per child.